i haven’t always been the corn-on-the-cob’s number one fan, you might say. i like my corn to have a little sumthin’ goin’ on, if you know what i mean. so there i was, looking for a summer corn recipe that would light my fire. then the lights shone down from heaven and lit up this recipe like a shining beacon on my computer screen. we made this for the party we had in may for the little she’s 2nd birthday and i would like to report that it lit everyone’s fire. i still dream about them. really. 2. prepare corn on the grill or in the oven. grill method: heat a gas grill over medium-high heat. transfer corn to grill; cook, turning occasionally, until a bit charred and cooked through, about 20 minutes. oven method: place ears of corn on a cookie sheet and roast at 350 for about 30 minutes, turning after 15 or 20 minutes to make sure all sides are cooked. 3. brush ears of corn with mayonnaise. 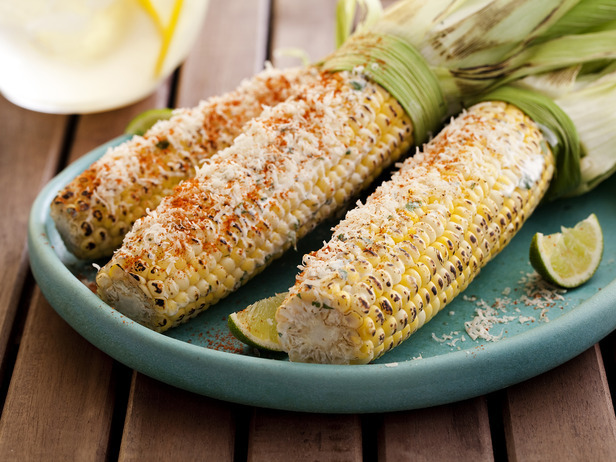 place cotija cheese on a large plate and roll each ear of corn in the cheese to coat. sprinkle corn evenly with some of the cilantro, chile powder, and pepper, pressing the corn so that the seasonings and cheese will stick to the mayo. serve with lime wedges. this side dish makes me so happy, i’d probably eat it for the main course. it is light, refreshing, and the perfect thing to go with anything on the grill. it’s ingredients lean southwestern and mexican, so it goes really well with chips & fresh salsa or a big cheesy plate of enchiladas. i even think it would strike the perfect balance with a burger or a steak. 1. cook 1 cup rice according to package directions (about 12-15 min). meanwhile, whisk lemon juice and 3 tbsp olive oil in a small bowl. season dressing to taste with salt & pepper. 2. heat 1 tbsp olive oil in a large nonstick skillet over medium heat. 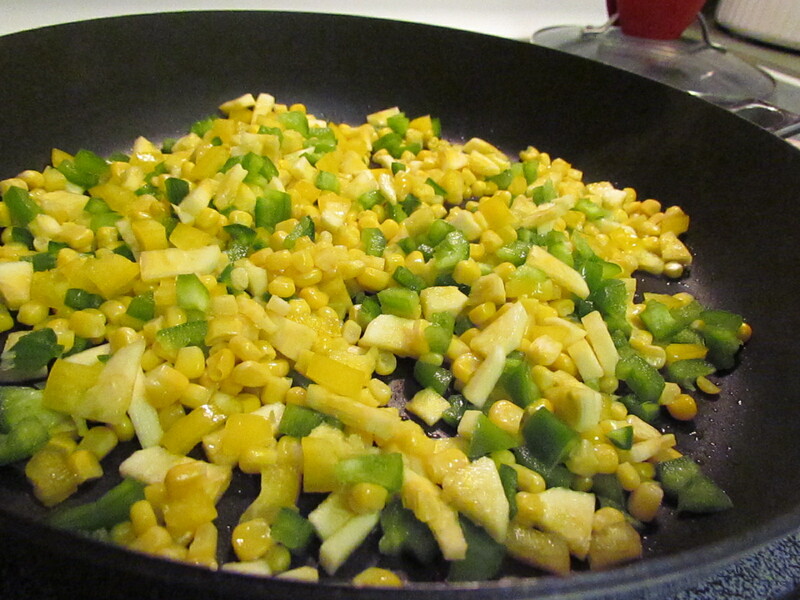 add corn, green bell & yellow bell pepper, jalapeño, and zucchini. sprinkle with just a bit of salt & pepper. saute until veggies are just tender, about 6-7 minutes. place in a large bowl. 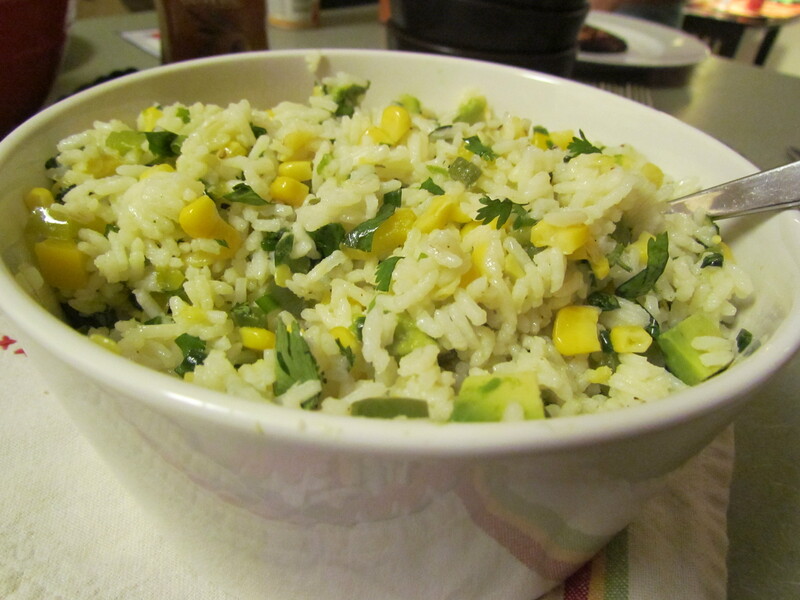 3. add rice, green onions, cilantro, and dressing; toss to coat and serve. top each serving with diced avocado*. * this recipe makes a pretty big batch so we had leftovers at the end of the evening. because of this, i add the avocados in with each serving. otherwise, the avocado will turn brown with the leftovers in the fridge.